Time to consider the heat-pump equation. It is less than two years since the 2013 revision to Part L of the Building Regulations came into force, a key milestone towards the Government’s target for all new non-domestic buildings to be zero-carbon by 2019, and it has come as no surprise that the energy-efficiency requirements of new buildings continue to rise. The 2013 revision of Building Regulations Part L2A (conservation of fuel and power in new buildings other than dwellings) demands a 9% improvement over the 2010 document, which itself set a 25% improvement on 2006. And Building Regulations are not the only driving force putting pressure on the sustainability of new projects. In many cases local planning requirements will demand even greater levels of efficiency. Specified improvements over Building Regulations such as BREEAM ‘Excellent’ or the ‘Merton rule’, which requires new commercial buildings over 1000 m2 to generate at least 10% their energy requirement using on-site renewable energy sources, are becoming more and more common. Heat pumps extract warmth from the air or the ground and upgrade its temperature to provide highly efficient, economical heating. They are reliable and cost-effective; with additional income on offer from the Government’s non-domestic Renewable Heat Incentive (RHI), they can pay back sooner than you might think. 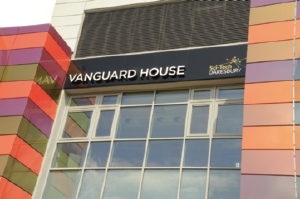 A Dimplex ground-source heat-pump system provides low-carbon heating and passive cooling for Vanguard House of SciTech in Cheshire. The building was designed to achieve BREEAM ‘Excellent’ and does not use any fossil fuels. In addition, the L2A document now makes it mandatory to consider the economic feasibility of heat pumps — and give a good reason why they haven’t been selected. Together, these factors ensure heat pumps are also perfectly placed to help project managers to meet planning and sustainability requirements — without hitting the bottom line. Part L is driven by CO2 emissions for the building, so low-carbon solutions enable easier compliance and with lower achieved CO2 emissions than gas boilers, oil boilers and LPG boilers; heat pumps tick all the right boxes. For space heating, an air-source heat pump with CoP (coefficient of performance) of 3.5 running with low-temperature emitters such as Dimplex SmartRad or underfloor heating will emit 0.13 kg of carbon per useful kWh. Compare that with a brand new, A-rated gas boiler (0.21 kg), oil boiler (0.32 kg) or LPG boiler (0.29 kg,) and it is easy to see why heat pumps are reflected favourably in SBEM (Simplified Building Energy Method) and BREEAM. What’s more, with a heat-pump installation new buildings can meet their target Building Emission Rate (BER) with reduced installation costs, lower running costs, simplicity of operation and reduced visual impact than an alternative system comprising of a boiler and solar PV. Dimplex has launched a series of CPD programmes to support M&E contractors and project managers who are considering the benefits of heat pumps and there has never been a better time to go green. Heat pumps are also well placed to meet the requirements of BREEAM too — the commonly-used, points-based assessment method for commercial buildings. BREEAM ‘Excellent’ is now a requirement of all new Government buildings, Department of Health new build, DEFRA new build and some local-authority buildings — depending upon the local plan. For many more projects, it is a standard of excellence which is coveted but not unobtainable thanks to the continued development of renewable technologies such as heat pumps. 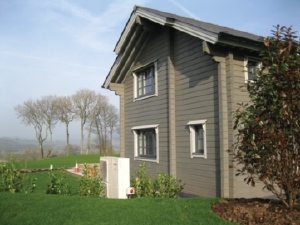 10 Eco-friendly log houses at the 5-star Celtic Manor Resort near Newport in Wales have heating and hot water provided by Dimplex air-source heat pumps. Simply considering heat pumps during the design process gains easy BREEAM credits, which makes this technology a no-brainer for any project looking to prove its sustainability credentials. Of course, none of the environmental benefits of heat pumps would be relevant if the technology was not cost-effective. The biggest concern for many organisations looking to meet specified targets for carbon reduction is what impact it will have on the bottom line — and there is more good news for those willing to go green. The non-domestic RHI was first launched in 2011 but after a period of consultation with the industry, tariffs were revised in 2014, and the rewards are now even greater. Providing the equipment is metered, commercial air-source heat pump installations can earn a tariff of 2.5 p/kWh over a period of 20 years, which could mean additional income of £5000 per year for larger premises (based on a 100 kW commercial property with space heating demand of 200 000 kWh per year). For ground-source heat pumps, the investment is greater, but so too are the rewards. With a tariff of 7.2 p/kWh, a similar property can expect to receive £14 400 per year over the 20-year period. All this, of course, is on top of lower running costs compared to oil or LPG boilers. Inevitably, with continued innovation, improved efficiencies and higher tariffs come lower payback periods. Now is the time to consider the heat-pump equation. Clare Campbell is marketing manager for renewables products with Dimplex.